In the history of democracy in India, the Bihar state assembly elections will be recorded as a major turning point. The voters rebuffed the Indian Prime Minister’s party that unleashed a divisive poll campaign to consolidate the Hindu voters in its favour. The voters gave a stunning victory to a coalition of secular parties with socialistic leanings and a commitment to social justice. One public intellectual, Pratap Bhanu Mehta, sees this victory as a “potentially regenerative moment for Indian democracy”. The regional elections came in a season of hate-mongering and the rejection of religious polarisation brought relief to millions of Indians across the nation. They feel perturbed by the rise in the levels of intolerance and by the rampaging bands of provocateurs inciting religious passions and violence. It is inappropriate to call these Indians ‘liberals’. They are indifferent to political ideologies and can say ‘plague on both your houses’. The Modi-supporters are using the word “liberal” as a term of abuse. Behind these protesting ‘liberals’ stand the Indians representing civilisational values and a pluralistic culture. Their faith teaches them to respect all religions and question all sacred doctrines. They do not take to the streets but watch with concern the descent of a nation into a communal cauldron. India’s political history shows that at times Indians get swayed by passion and an outbreak of sectarianism follows. But when they observe excessive intrusion of religion into politics, they punish the political force that unleashes such passion. They thus force a course-correction, reaffirming their faith in India’s secular Constitution. When a political party sees its sectarian card not yielding votes, it turns moderate for some time. This process of swinging from an extreme to moderation has not only kept democracy alive but has given it a certain depth. Sweeping victories for one political formation or the other are not uncommon. But two factors turned the Bihar elections into one of the biggest political events of the recent past. One is the context in which the elections were held. These came in the midst of a cultural war in which intellectuals, academics, writers, creative artists and scientists are protesting against the rising intolerance affecting the freedom of speech and leading to incidents of violence, including murders. The divisive anti-Muslim statements came from those associated with the Prime Minister’s party. The BJP leaders attacked those talking of “intolerance”. None was spared in this and eminent citizens were called names and condemned as traitors! Those issuing provocative statements have been emboldened in the past 18 months, thanks to their association with the ruling establishment. The Prime Minister himself played the caste and religion cards in the Bihar poll campaign while some of his fans urged him to restrain the “fringe elements” of his extended political family. Those attacking the writers and scientists shout that there is no intolerance in the country. No agency records the levels of mental pollution and no scientific instrument records the intolerance levels in a society but even a casual visitor seeing the TV channels or the newspaper headlines will be struck by the current atmosphere of hatred and incipient violence. On four different occasions, the President of the Indian Republic found it necessary to remind the nation of India’s traditions of tolerance and pluralism. Democracy can be threatened not just by the State but also by violent vigilante groups trying to ensure that the people think, write, eat, drink and wear only what they allow. India is seeing a proliferation of such vigilante groups acting as the thought police or the moral police. They have even victimised some foreign tourists. Of course, in such cases, it is not the Government that restricts freedoms. It is merely letting such groups issue threats. When two communities clash because of agent provocateurs the Government can issue pious peace appeals! The imperial powers treated the natives in the same way. To fight terrorism a democratic Government also uses the private armies and vigilante groups so that it is not held accountable for the illegal methods deployed. The same happens in the domain of free speech when a ruling party’s cadres go and threaten a writer or blacken someone’s face. The vigilante groups forced an eminent Indian artist to go into exile or prohibited Salman Rushdie’s participation in a literary festival. Once at a reception in London, this reporter asked the head of an organisation working for freedom of speech whether they were doing anything against the media moguls and the advertisers who exercise control over free speech. The person ignored the question and just moved away! The second unusual feature of the Bihar state elections was the Prime Minister’s frenetic and aggressive participation in the campaign. Narendra Modi addressed a record number of election rallies, sidelining the state-level BJP leaders. He plunged into the battle because of his immense faith in his vote-pulling capacity. His oratory and dramatic gestures that won him the national elections 18 months ago proved to be a damp squib in Bihar. 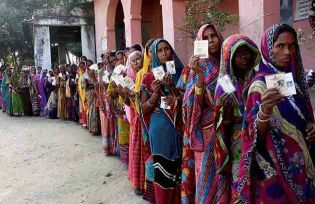 Early this year in another regional election for the Delhi state assembly, the Prime Minister failed to move the voters. If the Bihar results are also seen as a referendum on Prime Minister Narendra Modi it is because he decided to lead the election campaign. This is not what Indian Prime Ministers normally do. The state election results are expected to impact the national political situation in which the Prime Minister’s image has lost its lustre. His competence to boost economic growth and check inflation and corruption has come under a scanner. His approach towards the unfriendly neighbour Pakistan as well as towards the friendly neighbour Nepal has had negative consequences. Most Indians are not impressed by his pop-star role at the light-and-sound spectacles organised for him in the US by the overseas Indian Friends of the BJP. London’s Wembley Stadium is set to witness a similar event during his coming visit to the United Kingdom. The political setback as a result of what one commentator describes as a vote against hubris poses no immediate danger to the career of Narendra Modi. Nor can it alter the long-term objectives of an ideologically-fired strong cadre-based Hindu organisation called the RSS of which the BJP is a political wing. The RSS is not vulnerable to internal factionalism or dissent, because the leaders are not questioned. Some introspection in the Prime Minister’s office may however lead to a greater emphasis on the state’s role in securing social and economic justice for the oppressed and deprived, and a little less of courting big business in India and abroad. The lack of mass contact by the previous Prime Minister Manmohan Singh and his Government’s failure to curb corruption enabled Modi to come to power as a Messiah. Modi played down the outgoing Government’s measures relating to citizen’s rights to information and education. The Prime Minister may now fine-tune its economic policies to send the message that he is not biased in favour of rich businessmen. This has to be done long before the next regional elections. It will be more difficult to rein in the rampaging ‘fringe elements’ who felt encouraged by the ruling party’s inaction against them. Will they stop inciting the people? The damage inflicted on the social fabric of India in recent months will not be repaired soon. However, the protesting writers and Bihar’s anti-BJP voters have achieved one big thing. They have thwarted the ambition of BJP-RSS combined to induct an element of Hindu autocracy into the Constitution in order to formally alter the idea of India. The related agenda will go on the backburner for the fear of further public protests and political damage. At this point of time, many perhaps are reminded of an Urdu couplet by poet Iqbal saying that there must be something in us that we still exist while some other civilizations have gone into extinction!